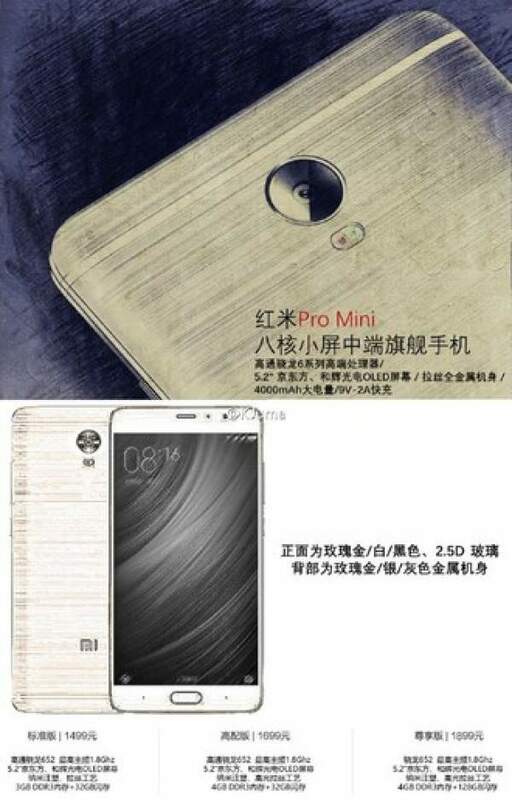 Xiaomi is ready to launch the new device in the compact version by the name Xiaomi Redmi Pro Mini. Kjuma, a micro-blogger who leaked the news about the news of RedmiPro Note through a website Weibo. No other source has any information about the new and expected launch of this compact version of the Redmi device. Over the specifications, the device comes with a 5.2-inch display with a resolution of 1920 x 1080 pixels. Unlike the primary Xiaomi Redmi Pro, this device has a small screen but the same resolution. Since this smartphone is a compact version, so Redmi Pro Mini is powered by a Qualcomm Snapdragon 652 chipset. Unlike the primary RedmiPro, the device features an octa-core CPU instead of deca-core CPU, four high-speed ARM Cortex A-72 cores( Redmi Pro has two A-72 cores) which might be paired with four power-efficient Cortex A-53. The device is expected to come in different variants. The device might have one model with 3 GB RAM and 32 GB internal memory; another model might have 4GB RAM and 32 GB internal storage and the other model might be having 4 GB RAM and 128 GB internal memory. The device is expected to be powered by a 4,000 mAh battery with 9V/2A fast charging technology. Like the poster, the phone is expected to have a single lens primary camera flanked by a dual-tone LED flash units on its back. The device has some features too. The smartphone will also feature a 2.5D display glass cover and a fingerprint scanner embedded in the home button. This phone is ready to give a tough fight to the multiple smartphones with expensive names and same specifications. The device is going to be a competitor of LG G5 SE, Samsung Galaxy A9, and Asus Zenfone 3 Ultra. The Redmi Mini Pro is expected to be priced at CNY 1,499 (about $225) for the 3 GB/32 GB model, and the price of 4 GB/32 GB is expected to set at CNY 1,699 (about $255). The top model variant of the series is expected to be priced at CYN 1,899 (about $285). This might not be the enough information you are looking for, but I am sure that you will get the appropriate and satisfying information very soon. As the news gets in the market, you will be getting the news about your favorite smartphone, Redmi ProMini. In the coming weeks, you are going to hear more about this device.